A few days ago, Joanna Robinson and I launched a Kickstarter for 10 episodes of our Game of Thrones podcast, “A Cast of Kings,” set to coincide nicely with season 3 of the show. We were both totally floored by the response, as we saw our $3200 funding goal reached within 48 hours. Before I go any further, let me just make sure to say: Thank you. To anyone who donated, to anyone who supported us spiritually in this, and to anyone who has just listened to the show. We are so grateful that you believe our endeavors are worth paying for. This being my first successful Kickstarter, I thought it might be useful for me to share a couple of thoughts on the process. I did not think we did a great job at creating an exemplar Kickstarter project – I am aware of the elements that go into a stereotypically successful Kickstarter project, and I am equally aware our project did not possess them. I actually got a lengthy e-mail from a concerned listener named Adam, offering ways to help improve the Kickstarter and set it up for success (I share some of his advice below). The reason the Kickstarter deployed as it did was because I was kind of interested to see how challenging it would be to mobilize our fanbase to donate for us. While some of my thoughts were proven true, others weren’t — again, more on this below. More than anything, this Kickstarter was an experiment. Kickstarters should have videos – Kickstarter strongly recommends each project have a video, and statistically, projects with videos are more likely to be backed. Concerned listener Adam recommended “a short 3 minute video with you on camera talking about how much this means to you. People donate to people, not to projects. If you go on there and really let people know how much it means to you, then they will be far more inclined to donate.” I think the biggest reason for no video is because I would have felt weird making one without Joanna — we live many miles apart and I’ve never met her in person. But time was also a major consideration. Rewards should be more incrementally spaced – It’s a pretty big jump from $10 to $150. I get that. But ultimately, I didn’t really feel like I could commit enough time to promise additional rewards. I realize that some projects have “stretch goals,” but I already think doing the podcast as currently planned will be a significant commitment. Beyond additional episodes, I wasn’t really sure what else I could offer. One suggestion that did strike me as a good one, which I now wish I’d included, was the promise of reading a listener e-mail on the air. Explain more about you and your talents – In an ideal Kickstarter we would have done more of this. But really, I was counting on a) the proof of concept of the past 10 episodes we did, and b) the fact that people would trust us to deliver a quality product, based on those episodes. Explaining more about yourself is necessary in a situation where you are marketing the Kickstarter to complete strangers. 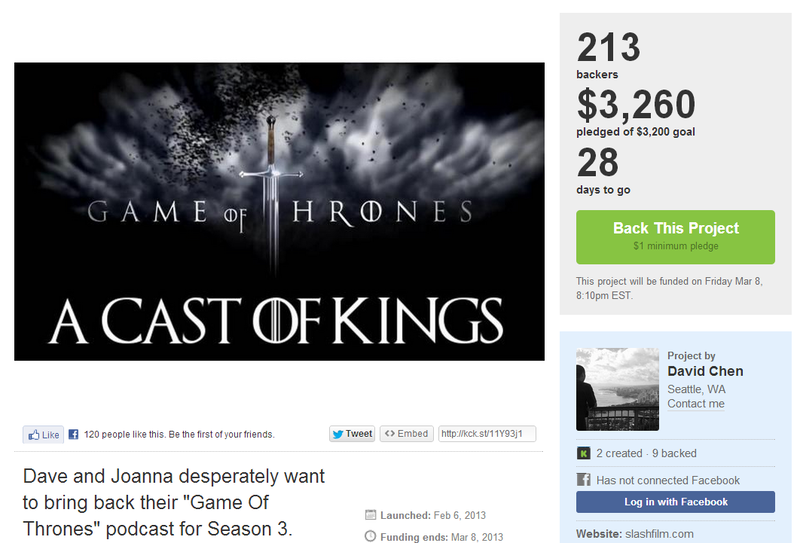 I did not think we fell into that category, although in the end, a lot of non-Cast-of-Kings listeners did end up donating. Outline what the costs are – My single biggest regret is not doing a better job of articulating where the money is going. In this instance, there are a few fixed costs in terms of equipment (a replacement mic for Joanna), HBO subscriptions (which I don’t currently have), the domain name for the podcast, etc. Kickstarter and Amazon payments take a significant percentage of the total amount (about 8-10% between the two of them), plus Kickstarter funds are also taxable — how much is a little complicated and still unresolved, but it’s safe to say Uncle Sam will take a huge chunk. The biggest cost, though, is time and effort. Thus, the remainder of the funds will be divided up between Joanna and myself. There seems to be a significant misconception online that podcasts take no time or effort whatsoever. They do take time. They do take effort. They don’t just appear on the interwebs like babies in a cabbage patch. Occasionally, some people who do certain podcasts may ask for money for the time and effort that goes into making a podcast. Why anyone would object to this is something that is beyond my ability to fathom. My personal goal was not to extract as much money as possible from a single Kickstarter – This Kickstarter was really an experiment on my part, to see if people would be willing to pay for a single, limited run podcast. Many people asked things like, “Why not promise stretch goals? Why not offer more rewards? Why not offer more episodes for more money?” etc. But the goal was not to make as much money as possible. I’m far more interested in how sustainable this model is. How many podcast Kickstarters per year can be launched this way and successfully funded? How many times can you annoy people on Twitter to donate before they stop following you? What is the right balance? These are questions I’m really interested in because they go towards answering the ultimate question: can someone make a decent living off of doing podcasts? In the days to come, I’ll be doing some more experimentation with Kickstarter and seeing if we can get to the bottom of this question. The true dream of TRUE crowdfunding still eludes us, or at least, me – In my original podcast episode announcing the Kickstarter, I said that if everyone listening to the podcast donated $1, we’d have more than enough to fund the show. In my dream, everyone donating a tiny amount could create a huge impact. Things didn’t really work out that way. As you can see in the header image, the average donation was closer to $15. The vast majority of people donated $10, and there were a couple extravagant donations (including some backers that chose the $150 reward option). I’ve heard many theories for why so few people made small donations. Peter Sciretta from /Film opined that the pain of filling out all the Kickstarter info is not worth a $1-2 donation. Matt Singer explained he thought that people didn’t think a $1-2 would truly help. The caveat here is that by reaching the goal in 2 days, we didn’t have a long enough timeline to extract too many statistically sound data about user behavior. But if it is accurate, this does force me to to recalibrate my expectations for future Kickstarters. If the average donation is going to be $10-15, then the value that we are delivering needs to be in line with that, as does the expectation for how many people we can expect will donate.